The Omega 8003 juicer is a commercial grade product made from highly durable parts that stand up to intense use. While some juicers have weak parts that can break apart easily, you won’t have that problem with this juicer. 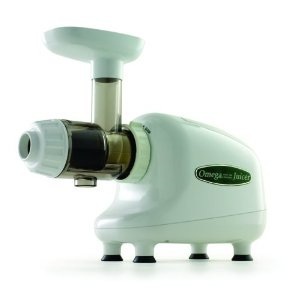 There are even some Omega models that have problems with durability, but that tends to be with centrifugal juicers more than the masticating models. Let’s take a look at the strengths and weaknesses of this model so you can compare and contrast with other masticating juicers. Slow 80 RPM rotation speed. Does not clog as easily as some other juice extractors in its class. Grinds and minces as well as juices. Can be used to make pasta. This is a highly efficient juicer that will produce colorful juice rich with vitamins and minerals. The pulp that is automatically spit out of the machine is drier than what you find from most centrifugal juicers. This simply means you are taking in more vitamins and minerals in your juice rather than throwing it away. Add in that you can do other things besides juice with the machine and you see why masticating juicers are more functional than centrifugal juicers. Slower to operate than centrifugal juicers. Smaller sized chute requires more chopping and dicing before use than some of its competitors. It is no secret that you will have to wait a bit longer to make juice with a masticating juicer. The slower speed of the machine prevents foaming and the build up of heat which is great for the vitamins and minerals in your juicer. It just might not be as great for your schedule, so make sure you have the time to juice when you turn this machine on. The smaller chute on this model may slow the process down even more, since you will spend more time cutting up your fruits and vegetables if they are not naturally small enough to fit into the chute. It has to be noted that the complaints lodged against this medel are very minor in comparison to the complaints heard against some other juicers. There are far more positive points about the machine, which is why you will be hard pressed to find even one completely negative review for this machine. Most users agree that this juice extractor is efficient, nicely designed, and durable enough to last many years. Not only will you produce delicious, healthy juice with this machine but you can grind up coffee beans, make freshly chopped spices and herbs, or turn out homemade pasta in no time. The ability to do all of these very functional duties in the kitchen is a feature shared with most masticating juicers. This is a machine that you can use for many different jobs while creating fresh meals, snacks and drinks for your family and friends.